Set Top Box or STB has become an integral part of TV viewing in many parts of the world. We commonly see this sleek looking device sitting on side of TVs. Though this device looks slim and simple but it is one of the most complex embedded systems today. STBs are increasing their feature set day by day. Few of the common features in current generation STBs are time shift mode viewing, recording, Internet based viewing, video on demand, Full High definition video output etc. STB is very complex embedded system; it consists of 30+ hardware blocks and similar number of software drivers. STB has lot of computing power distributed across main processor and various co-processors. In few of top end STBs if we add operating frequencies of all co-processors then it would be in range of 3-4 GHz. A typical STB would look similar to one shown in following image. This is picture of standard definition (SD) satellite based STB being used at my home. Number of components used is fairly less compared to complexity of this system. This credit goes to the main STB decoder chip which integrates a lot of hardware components required into a single chip. The above picture shows STB circuit board and major components on the board. A more logical relationship between various components is shown in following block diagram. STB Decoder: This is heart of the whole system. In current generation STBs most of the features required by STB system are integrated in STB decoder chips. This level of integration is called System On Chip (SoC). STB SoCs contain a large number of blocks ranging from de-multiplexer to decoders and peripherals like USB, SATA etc. Front End: Front End part of STB is responsible for receiving the broadcasted signal, demodulating the signal and outputting digital data output for STB decoder chip. Depending upon broadcasting environment terrestrial or satellite or cable front end will be used. Front end unit consist of 3 main blocks tuner to tune correct frequency, demodulator to demodulate as per standard and forward error correction (FEC) unit for data recovery. Power Supply: This is the main power source for board. This unit generates different voltage required by various components on board. Input to this unit can be main line AC (220/110) or DC 12V via standalone power adapters. Flash: This is used to store boot loader, main application and other user specific non volatile data. Different STBs uses different sizes of flash ranging from 8MB to 64MB. RAM: RAM is used to store all intermediate data (such as decoded video/audio buffers) and application variables. In many cases main application is also copied to RAM and is executed from RAM to speed up the operation (as RAM is faster compared to Flash). RAM size ranges from 32MB in standard definition STBs to 256MB in some top end Full HD STBs. Video Interfaces: STB decoder chip outputs video data in analog or digital format. To make these signals compatible with external devices, special circuitry like filter and physical connector are required. Current generation STBs provide many video output formats such as CVBS, S Video, Component video and HDMI. Audio Interfaces: STB decoder chip outputs audio data in analog as well as digital format. In some cases high quality DACs are used to convert digital data into analog format. Digital data is also transmitted in digital format using SPDIF standard. Storage: Few STBs also work as digital video recorders. To aid storage of programs some storage device (HDD) is added via any of the interfaces (SATA, eSATA, ATAPI or USB) provided by decoder chip. Front Panel: This is STBs interface to external world. Front panels are different for different boxes. But most of them provide IR input/output, Status LEDs, 7 segments or LCD and few switches to configure set top box. These features are controlled by parallel IOs of main decoder chip. In some cases a dedicated microcontroller is added to front end to reduce processing load for main chip and also to reduce the number of wires going from front panel to main PCB. DVB-CI Slot: This slot is provided to support various conditional access schemes. Conditional Access providers provide compatible DVB-CI cards to be used with STB. The DVB-CI card decrypts the channels encrypted by Conditional Access provider as per user’s subscription policies. Smart Card Slot: This slot is provided to use smart card for Conditional Access implementation. Unique subscriber ID is stored on each card. Smart card is also used in decrypting the channels. RF Modulator: This is used to modulate Audio and video into RF signal. This is mainly to be used with older TVs which have only RF input and no composite (CVBS) input. STB Decoder is one of the most complex system on chip (SoC). There is generally one main processor and lot of co-processor doing dedicated processing. A typical decoder SoC will have following blocks. Main CPU: This is the main CPU executing the STB application. It is a general purpose CPU with lot of development tools available. Its speed range from 200MHz on standard definition devices to near 1GHz on High Definition devices. The main CPU is generally based on industry standard core such Super H or ARM to improve ease of tools and reusable stack availability. 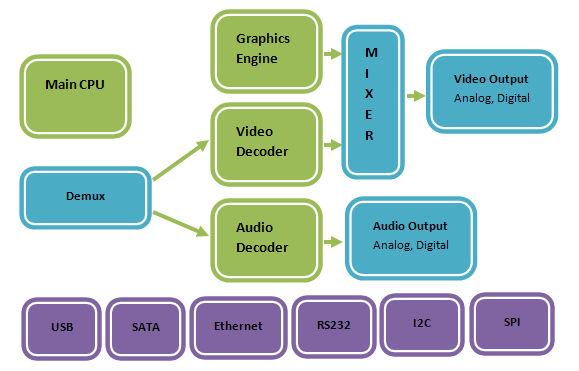 Video Decoder: This co-processor is responsible for converting compressed video (MPEG) data into basic video format. Current generation decoders have programmable video decoders, so video decoders can support a variety of formats such as MPEG2, H264, VC1 etc. Graphics Engine: This co-processor is dedicated to graphics acceleration. Its main task is to draw pictures and menus for user interface (UI). This unit is becoming more powerful these days with introduction of 3D menus. Mixer: This block is responsible for mixing the video output and graphics output and producing a final single image. This is also responsible for ordering of video and graphics plane and transparency settings. As shown is image there are two planes one video in background on video plane and other is rectangular window showing program information on graphics plane. These two planes are mixed by mixer to generate a single image. Video Output: Final result after mixing video decoder and graphics accelerator outputs is provided to video output block. This block is responsible for outputting data as per required standards (PAL, NTSC, SECAM, HDMI). This block generates output in analog format using DACs. This block also generates output in digital format using HDMI convertors. Audio Decoder: Audio decoder converts the compressed audio data into basic audio data. Audio decoders are also programmable these days. They can be programmed to support any audio standard. Audio decoder generally supports MPEG, AAC, Dolby formats. Audio Output: Audio output is fed to audio output block. This block provides audio output in analog format using internal DACs and in digital format using SPDIF convertor. Peripherals: Other than main decoders and CPU a lot of peripheral devices are supported by STB SoCs for providing various features. SATA: used to connect HDD for providing digital video recording facility. I2C: Used by main STB SoC to communicate with external peripheral devices such as front end, SCART controller, HDMI controller etc. SPI : Used for connecting to non-volatile storage on serial flash devices. STB Software is organized as layered architecture as shown in block diagram below. RTOS is generally STB company proprietary or some industry standard OS such as Linux. Software drivers are written for all hardware blocks and some software components. A typical STB has 30-40 different drivers. Middleware is generally used to standardize the interfaces from drivers to application so that device independence can be provided. Final application is on top of middleware and it usually remains same for one service provider across different STBs.